We offer good quality product with best customer service. Our management team with international work experience want to build our company with product quality and customer service. 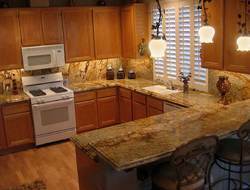 Our client can avail from the repertoire a qualitative range of Tropical Green Granite Kitchen Counter Tops. We process this making use of advanced machinery and precision techniques. These are in accordance with the required industry standards and offered in varied dimensions and finishes. We also offer these in customized specifications to meet the requirements of our esteemed clients. Banking on the skills of our qualified team of professionals, we are instrumental in offering a supreme quality range of Kitchen Countertop Granite. Being a quality oriented organization, we are indulged in providing supreme quality range of Granite Kitchen Countertop. As per our Customers preference for style and look, we would introduce the range in a wide array of captivating and contemporary design and colors. Our tiles are extremely durable & its contains low water absorbing ratio which is unique in market. Mark Glaze Tiles Pvt. 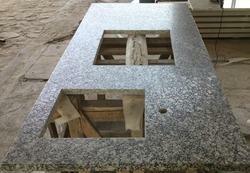 Ltd.
We are making all type of kitchen counter tops, all color and all size in the reqarment granite counter tops.